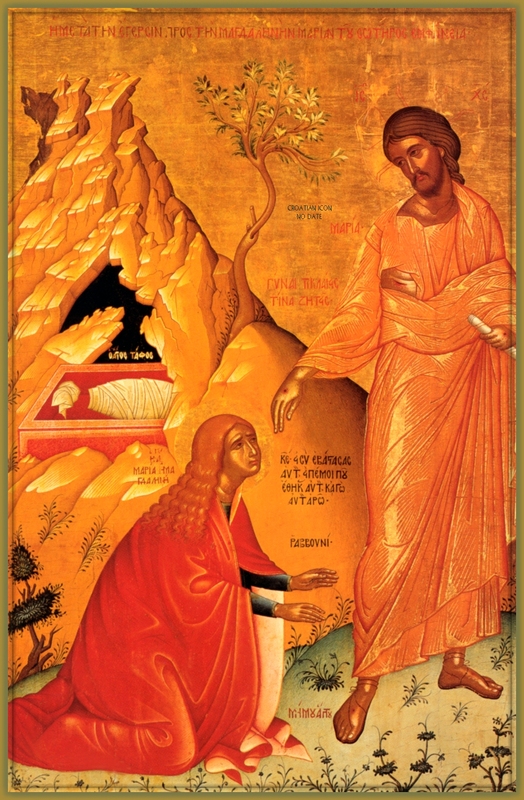 Today, July 22, the Orthodox Church celebrated the feast-day of St. Mary Magdalene. Despite the fact that women have been treated as second- or third-class citizens throughout the history of the church, this particular saint bears the eponymic of “Equal to the Apostles.” And, of course, that’s exactly what she should be called! Peter, Paul, James, John – any of the “apostles” – are in no wise superior to Mary Magdalen. She has even been called “Apostle to the Apostles,” because she bore the message of Christ’s resurrection to the apostles who were hiding in fear (John 20:1-2 & 20:18). There is another female saint celebrated in today’s Orthodox calendar: Saint Markella, “the Virgin-Martyr of Chios.” Here is my question: Why does a woman have to be a reformed sinful woman (as Mary Magdalene is presumed by the church to have been, as Mary of Egypt was), or a virgin-martyr, or a nun, or (in some cases) a widow, in order to be canonized? Why are there so few married women (and men, for that matter) who have been raised to the state of sainthood? Not, of course, that God is bound by decisions of the church as to who is a saint and who isn’t – but it is a question that should be asked. Why has so much preference been given to men and women who were not married? The question is worth asking because the Orthodox Church has so few examples of holy families to offer to a society where the family is calamitously on the brink of extinction. I was watching tonight on YouTube a program first telecast on Greek television in October of 2013. The entire program was dedicated to the music of Mikis Theodorakis – who, in my opinion, is not only the greatest composer of Greek popular music, but the greatest song writer of the 20th century, and beyond, of any nationality! He is an old man now, but he was there for this intimate celebration of his music. You can watch the video here: Στην Υγειά μας. Αφιέρωμα στον Μικη Θεοδωράκη. At about 21 minutes into the program Theodorakis and the host are talking about the continuing popularity of his music. The host calls the music an εργαλείο, a tool for the preservation of Greek culture and society, especially in the difficult times people are facing now. At 21:45 into the video, Theodorakis says something very profound. He says that the ark (κιβωτός) of survival in Greece is the family. It is the family that preserves the traditions, the culture, the music. I can relate. Growing up in a Greek home in Montreal, Canada, all I heard at home was Greek popular music. And I resented it. I resented hearing the same songs about hard work, poverty and emigrating to foreign lands. Despite the fact that I too was an immigrant and that I too was born poor in Greece and was still relatively poor even in Canada, I couldn’t take these songs. So I escaped to the Beatles, Bob Dylan, and other denizens of Anglo-American pop. But the Greek music was always there in the home. It was part of me no matter how much I tried to deny it. So later, in the late 60’s and early 1970’s as my own political and cultural awareness developed, I found these songs that I had previously resented to be far more beautiful, more meaningful, and far more stirring to my soul than any of the rock and pop songs that I had been listening to. The family environment was the key that kept me rooted. If I can speak and write Greek today and if I can drive around Portland listening to Mikis Theodorakis or Manos Hadjidhakis in my car (when I’m not listening to Wagner), it’s because of my family home. And I treasure my upbringing, despite the many hardships we endured. The family still is the cornerstone of Greek society, and it is still strong – though it’s beginning to face the same challenges as the European and North American family. The family structure is crumbling, and we see the results all around us: lower educational standards, drug and alcohol abuse, crime, alienation, irresponsible sexual activity, violent behavior, guns in the possession and use of minors, disrespect for elders and social standards – and an alarming estrangement from anything religious. No, families are not crumbling because of gays! And no, families are not crumbling because women are working. Women are working because the society requires it and the consumer obsession demands it. Don’t look for scapegoats and who to blame for what is happening to families in our country. Look inside the family and ask what is going on. What values are being preserved and passed on within the family home? What are the children hearing and seeing within the home? Is there a culture within the home that children are being exposed to when they come off their iPods or video games or social media? Or are the parents also hooked to their own iPods, TV sets and social media? Is there a unifying culture within the home? Does the family even eat together? Is there conversation around the table? Does the family go to church on Sunday morning? Or is team sport the only activity that brings the family together? Good luck with that. Thank God we have many families in our community that are valiantly swimming against the tide. I pray that the Lord will support these families in their efforts and give them the courage to cultivate unity of heart and mind in their homes. We Orthodox are committed to family values. Perhaps the day will come when the Church will work off its preference for monks and nuns and also recognize the sainthood of parents who raise faithful children. Perhaps some of our own hard-working, faithful parents will be saints – if not in the official calendar of saints, then in the infinitely more important list of saints in the mind of God. May it be so! Let’s honor families. They are indeed the Ark of Survival in our confused and directionless times. God bless the families of our community and families around the world. In Greece too! Categories: Uncategorized | Tags: Family Values, Mary Magdalene, Mikis Theodorakis, Orthodox saints | Permalink. Have you ever wondered why in the Gospels Jesus is often confused for Elijah? Who was Elijah? And why would people think of Jesus as Elijah? 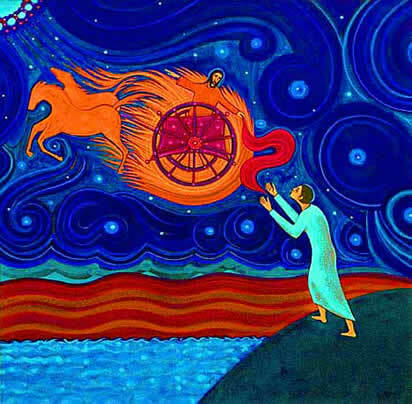 July 20th is the feast day of Elijah the Prophet, so I’d like to reflect on his life and relationship to Jesus. He is one of the most popular saints in the Orthodox Church: Prophet Elias (Προφήτης Ηλίας). 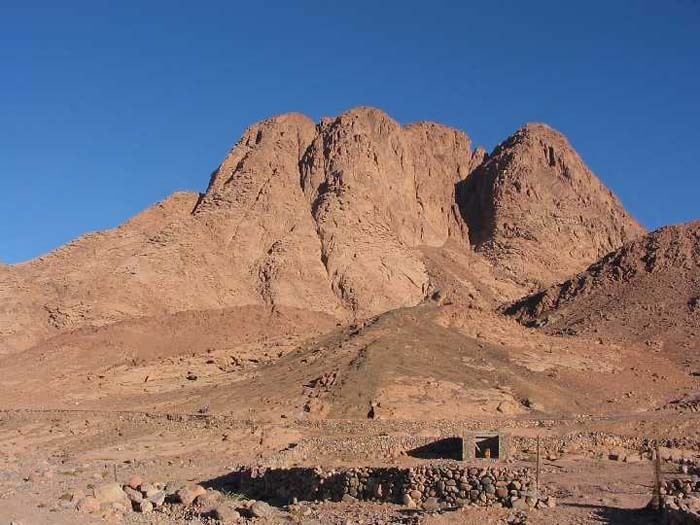 Wherever there is a mountain or hill in Greece it’s almost a certainty that at the peak is a church or chapel dedicated to the Prophet Elias. Elijah lived about 850 years before Jesus, so it seems that some people thought Jesus was Elijah come back from the dead. Not a totally unreasonable thing since no one ever saw Elijah die. But more on that later. My question is why would anyone confuse Jesus for Elijah? 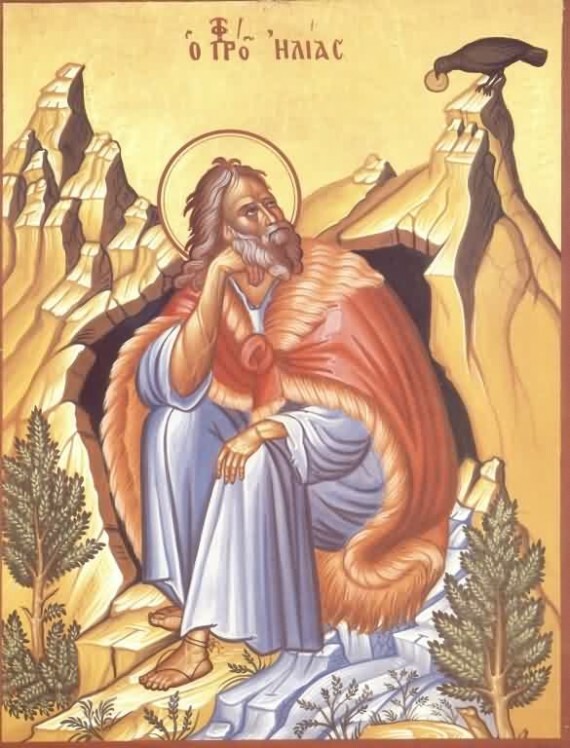 Was there any similarity between Elijah and Jesus? Between the ministry and activity of Jesus and the ministry and activity of Elijah? Neither wrote anything. Well, Jesus did write some words in the sand (John 8:6), but you know how it is with words in the sand; the wind quickly sweeps them away. Elijah was not one of those prophets who left writings . Both spoke truth to power and preached against idolatry and economic injustice. As a result, both were persecuted by those in power. 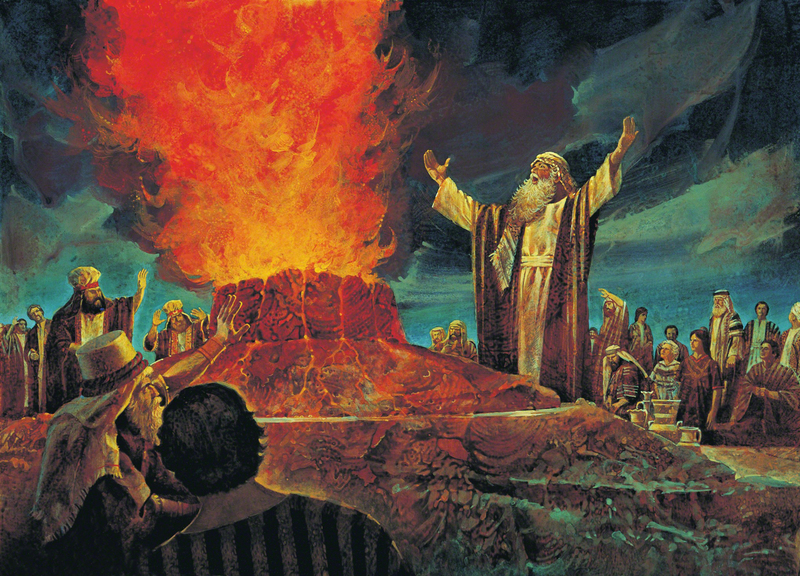 Elijah burst upon the scene soon after Ahab became king of Israel, around the year 870 BC. Ahab’s reign became notorious for injustice, idolatry, and for the worship of Baal, which Ahab and his wife Jezebel actively promoted. The name Jezebel has become almost a synonym for an evil woman. 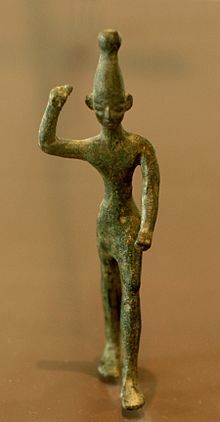 The name Baal was the generic name for a number of spirit-deities in Canaanite regions (mostly what is today Syria). Baal became the catch-name for the prophets’ attacks on the worship of idols and false gods during the centuries of the Israelite monarchy. Ahab and Jezebel were aggressive promoters of Baal worship. The First Book of Kings tells us that Ahab did more evil than all the previous kings of Israel. Elijah comes to Ahab (1 Kings 17:1-7) and declares to him that there will be no rain in the land until he says so! From this point on, he is an enemy of Ahab and the state! So he flees to the desert, where he is fed by ravens. Now that’s a challenge! Elijah will confront 850 representatives of Baal and the goddess Asherah – one prophet of God against 850 “prophets” of idols. The confrontation is spectacular, and it’s best to read it in 1 Kings 18:20-40. It is important to know that there are false prophets in the Bible. The prophets of Baal and Asherah were false because they were in the service of idols. But there were also false prophets in Israel who claimed to speak for God – but God did not speak through them, so they were false. False prophets were never troublers; they usually preached messages of false comfort and peace when there was no peace. In other words, false prophets were the servants of false gods and of earthly powers. Elijah’s defeat of the prophets of Baal and Asherah was followed by their extermination. This doesn’t sit well with us in the 21st century, it smells too much like the acts of terror that plague the world. It didn’t sit well with Elijah either. Though the biblical text (1 Kings 19:1-10) tells us that Elijah fled in fear of Jezebel, it is easy to read between the lines and discern the deep psychological trauma that he experienced after the showdown and massacre of the Baal prophets. 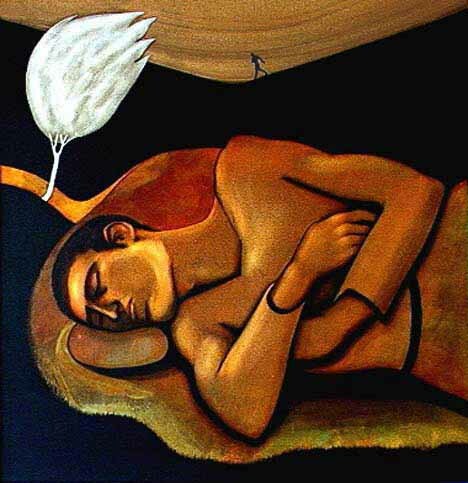 Elijah the Prophet is exhausted and in flight from the queen, who seeks to take his life. He is discouraged, convinced that his mission from God has come to an end. Elijah sinks into depression and sees himself as a failure. He wishes to die right there in the desert, but God has more in store for Elijah. Much greater encounters await Elijah, encounters with God across a thousand years. 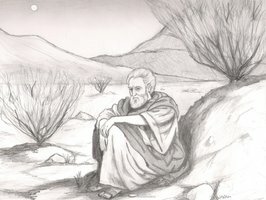 We will continue the story of Elijah in a second blog post this weekend. Thank you for reading this far. Categories: Uncategorized | Tags: Baal, Book of Kings, Elijah, Jesus, Mount Carmel, Prophet | Permalink. The Holy Bible: New Revised Standard Version. 1989 (Is 58:3–14). Nashville: Thomas Nelson Publishers. Categories: Uncategorized | Tags: Fasting, Isaiah 58 | Permalink. Today in the Orthodox churches that follow the Byzantine rite is the Sunday of the Fathers of the Fourth Ecumenical Council. 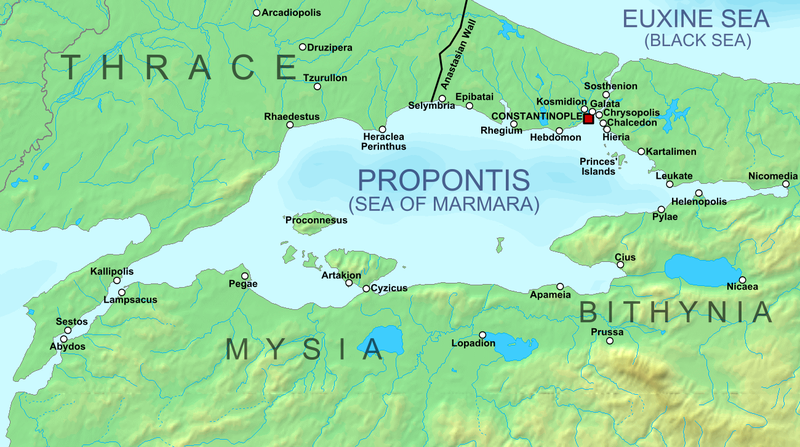 This was the Council that met in Chalcedon in the year 451. Unfortunately, the Council of Chalcedon was politically divisive and only in recent decades have we realized that the divisions that resulted from this council were mostly due to misunderstandings. Unintentionally, the Epistle reading for today, Titus 3:8-15, might cause one to pause and question the reasons for the 5th-century controversy. But we are not in the 5th century, we are in the 21st century and today’s Gospel reading, Matthew 5:14-19, is far more relevant to our own lives. It raises questions about the relationship of Jesus to the Mosaic Law and the place of legalism in our own lives. What did Jesus think of the Law? “Think not that I have come to abolish the law and the prophets; I have come not to abolish them but to fulfill them. For truly, I say to you, till heaven and earth pass away, not an iota, not a dot, will pass from the law until all is accomplished.” That seems clear enough – except it isn’t. Clearly he negated the law (or at least the way the law was understood) in these declarations. More importantly, he repeatedly ignored or broke the sabbath law. And how about the incident with the adulterous woman (John 8:2-11)? The Pharisees and the scribes of the law were ready to stone the woman to death, as required by the Mosaic Law, but Jesus challenged them: “Let the one among you who is without sin cast the first stone.” They all walked away and left the woman alone. In this too, Jesus saw the Law differently than the religious leaders of his society. In chapter 23 of Matthew, Jesus attacks the Pharisees and the scribes as hypocrites. At one point he says that “they tie up heavy burdens, hard to bear, and lay them on the shoulders of others; but they themselves are unwilling to lift a finger to move them.” Jesus is here undoubtedly referring to the many human laws that were added over the centuries and which had become a burden hard to bear by most ordinary people. The same can be said of the many laws that have accumulated in the church tradition, especially under the influence of legalistic monks. So what “law” does Jesus say he didn’t come to abolish? The Law God gave to Moses, or the hundreds of laws that were added to God’s Law? And here it should be noted that biblical scholars have proven that most of the laws in Leviticus and the other books of the Torah (the books attributed to Moses) came many centuries after Moses! Indeed, most of the laws attributed to Moses were actually added almost a thousand years later! Is it possible that Jesus had a different understanding of the “law”? After all, he is the Word of God, he is the author of everything that comes from God. He is the lord of the Sabbath, as he repeatedly asserted. If there is a Law that was given to Moses by God, no one can know it better than the one who wrote it! And that person is the Word of God. There are too many legalists in the churches. Too many people who easily quote Leviticus or some other book of the Bible to attack someone they don’t like or don’t agree with. But be careful how you quote Leviticus. Because the person you’re attacking might just be able to quote Leviticus back at you and have you stoned to death! I’m saying this tongue-in-cheek obviously, but it’s true. There are enough laws in the various books of the Bible to cover pretty much every one of us. So it’s best to avoid quoting Leviticus or any of the countless laws that legalists love. Jesus told us not to judge lest we be judged. So was Jesus ambiguous in his statement about abolishing the law and the prophets? Yes, and ambiguity is safer than thinking that you have it all figured out. When you think you have it all figured out, that’s when you become a legalist, and legalism kills the spirit. But did Jesus contradict himself? Superficially it appears like he contradicted his own saying. But if you look more deeply into how Jesus saw the Law, he was very consistent. Categories: Sermons | Tags: Chalcedon, Fourth Ecumenical Council, Jesus Christ, Legalism, Mosaic Law | Permalink. This blog is a place for theological and topical reflections and a sister to the website of the parish that I pastor, Holy Trinity Orthodox Church. The icon which Orthodox tradition calls “The Hospitality of Abraham” shows the scene in Genesis 18 when Abraham and Sarah were visited by three men who somehow represented the presence of God. Most likely they were angels, and the icon shows them with wings. But the iconographic tradition is very faithful to the book of Genesis and sees them as somehow representing God the Trinity. Indeed, this is the only acceptable icon of the Trinity; but it must not be taken as a literal representation of the Trinity. Trinity is fellowship – the fellowship of equals. But within the fellowship of equals, one is the source of being. Notice how the second and third persons are shown leaning toward the first person. Clearly, the two derive their being from the first. 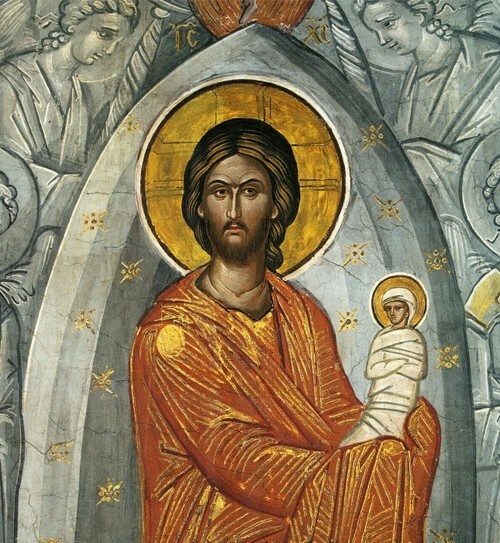 There is fellowship and movement in this icon. The inner life of the Trinity is dynamic. If the church is to be the medium of God’s presence and activity in the world, its existence must also be dynamic. The church fails when it chooses the safety of what is known no matter how outdated it is. The icon of the Hospitality of Abraham saves us from the danger of idolatry. It prevents us from thinking in exclusively masculine terms. The three figures are male, but masculinity is not what defines them. Their appearance and relationship to each other are expressions of profound theology and mysticism. One can pray before such an icon. One can experience mystical unity before such an icon. And every congregation can understand the mission of the church as fellowship and movement. There is something static about the terminology “Father, Son and Holy Spirit,” but the icon reminds us that the Orthodox tradition has drawn on the full richness of biblical language to speak of the Trinity. Especially important is the identity of Jesus as the Word (Logos), just as we read in the Gospel of John. The dynamic Word of God is the means by which God created the universe. “And the Word became flesh and dwelt among us” (John 1:14). In Philippians 2:6-11 Paul sees the entire history of Jesus as a story of movement. The first two verses of the Bible, Genesis 1:1-2, picture the Holy Spirit (the ruah of God) as a wind sweeping over the primeval chaos, before God began to give form to the creation. Today also the Holy Spirit sweeps over the chaos that humans have created: political chaos, economic chaos, environmental chaos, moral chaos, spiritual and psychological chaos, confusion in all realms of life and thought, devaluation of the arts, the loss of human individuality, privacy and freedom… The Spirit is ready to sweep away the chaos. But the chaos is created by us, so the Spirit will not sweep the chaos away without our cooperation. In the Acts of the Apostles (2:1-4) the Spirit is described as “a violent rushing wind” and “tongues of fire”! In (John 7:37-52), Jesus described the Spirit as “rivers of living water.” Dynamic images of movement describe the Spirit as much as they describe the Word. And it’s all because God wants to share fellowship with us – the same fellowship that exists within the Trinity. Yes, the Trinity is a foundational dogma of the Christian faith. But it is more than dogma. It is an invitation to share life with God and with each other. The life of the Christian should be a life of fellowship and movement. Look upon the icon of the Hospitality of Abraham and enter into the hospitality of God. Next time you enter Holy Trinity Church in Portland stop and gaze on this icon for a bit. Let it show you the inner life of the Trinity. Let it show you the life you and I are to live – a life of fellowship and movement. God does not remain still. Neither should we. The Christian life is meant to be a life of renewal, transformation and TRANSFIGURATION. More on transfiguration as we come to the feast of Transfiguration on August 6th. In the meantime, rejoice in the hospitality of God! 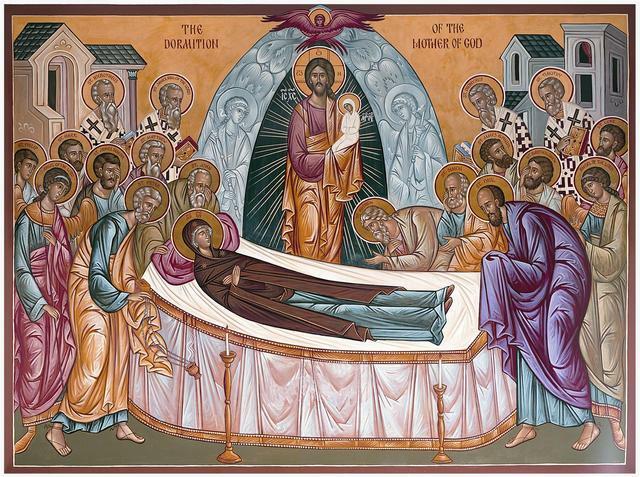 Categories: Uncategorized | Tags: Church, Icon, Orthodox, Trinity | Permalink.